YO. 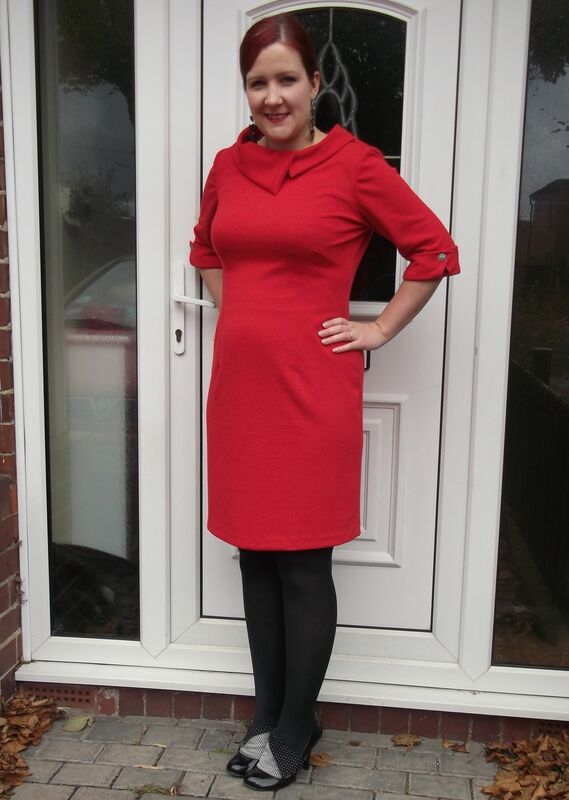 Here’s my final Red October make – a super cosy and warm wintery New Look 6000 dress! Once again, we’re in the territory of third attempts here. My first New Look 6000 was made back in December 2011 as a contribution to Scruffy Badger’s NL6000 Fest! It’s a beaut, but boy does that fabric wrinkle! You only so much as have to look at it, and it crinkles and creases like crazy! I would basically only wear this dress so long as I could stand up straight all day. Someone else would have to put my shoes on for me, and I wouldn’t be able to go pee or even walk up a single step. So…. not that practical! Enter Version 2.0: the black double knit New Look 6000. I have worn this to death! The shape is flattering, sophisticated and smart, and a departure from my usual style (as Captain Hammer would say: “Not my usual, but nice”). It’s been washed and worn so many times it is crazy bobbly, which is a shame. 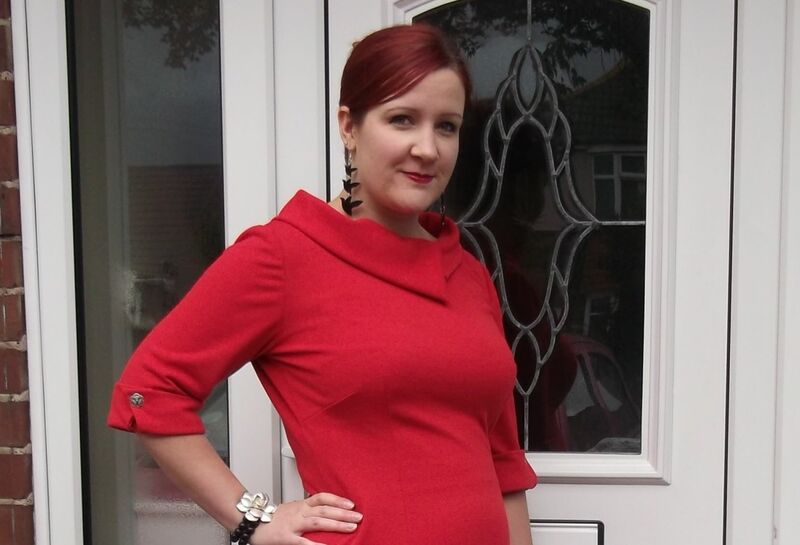 I wore it all through my last pregnancy, but it has held its pre-pregnancy shape. I literally NEED this dress, so I decided it was high time I made another one. And here it is: the red double knit New Look 6000. 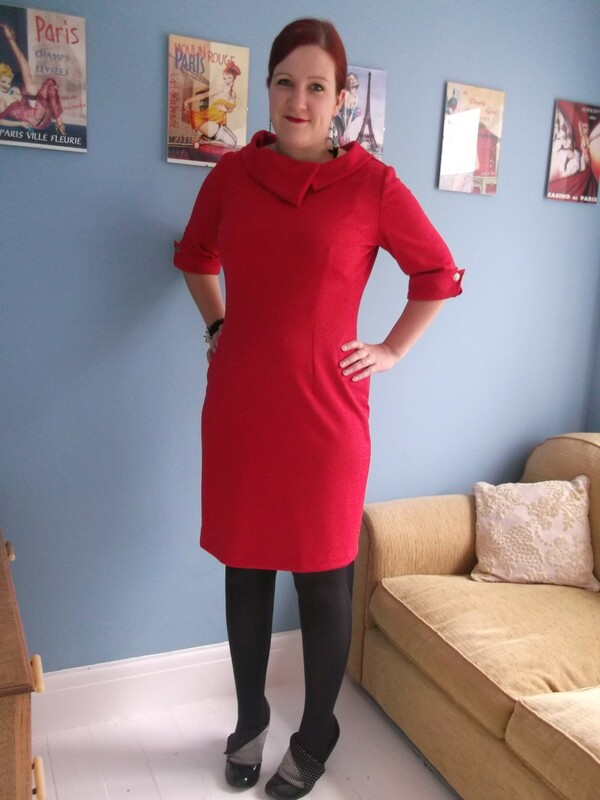 I remember Handmade Jane making this dress in the same red and looking super foxy in it, and I am so happy to now have my own version! The double knit is from Calico Laine and they have a good range of colours. I had to make substantial alterations to this dress when I first made it, but sewing it this time was pretty straightforward because I’d already done all the hard fitting work and transferred the alterations to my traced pattern. Part-way through I tried on the semi-finished dress to check the fit was still good, and I was pleased to find I didn’t need to change anything else. I added the collar to this version because I wanted to make the dress more interesting to look at. The collar didn’t turn out exactly the way the pattern prescribes, perhaps because I was working with a thick knit fabric rather than a woven. But not to worry – I like how it turned out. It’s a bit more open, relaxed and floppy than it should be, but the thick, warm cosiness of the double knit means I can get away with it. It kind of feels like I’m wearing a scarf! I omitted the back zipper due to the stretch within the fabric, but kept the centre back seam for the vent at the bottom of the centre back. However, when it came time to sew the vent, I felt lazy and didn’t bother with it! I sewed only one button to each cuff this time, overlapping the two edges and sewing through the sleeve itself. This means the cuff still look stylish but it’s that little bit flatter and therefore it’s easier to get your coat on over the sleeves. It also means the cuff doesn’t accidentally roll down. I had these two buttons left over from my first Colette Parfait dress, and they work reasonably well with this dress for now. I catch-stitched the inner facing down, and actually I may go back and unpick some of that stitching because it does show on the outside due to the nature of the fabric. I may wait until I’ve given it a wash first, though, just to see if it settles. I’m really in love with my third version of this dress. It is just so soft and warm and cosy but it looks really smart and makes me feel very well ‘put-together’ and quite grown up! Ooooooh! I have to say, I think this may be my favourite version of this dress. 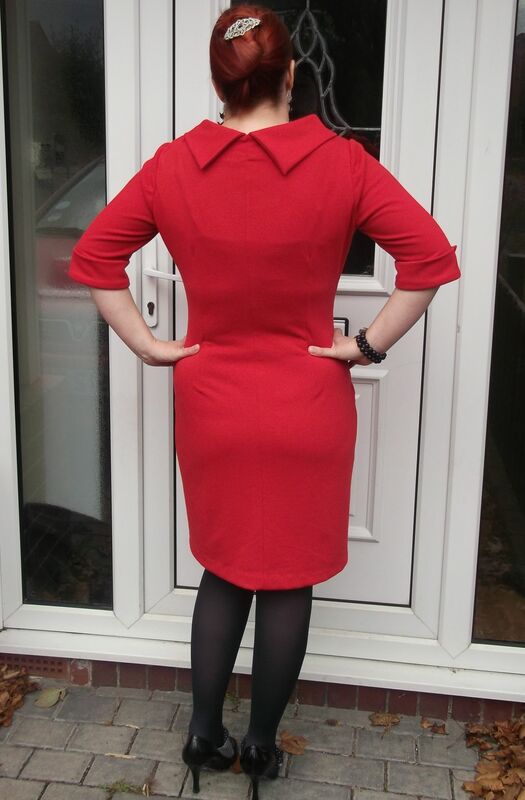 The red is so striking on you and I love the collar on this one! The asymmetry of it is so flattering. I also like the 3/4 length sleeves and cuffs. I think the silver button was a good choice. I may have to get this pattern now, as I’m realizing I really like everything about it, lol. Well, I can definitely recommend it! I didn’t like the collar at first, which is why my first two versions are without, but I’m definitely converted now! The only problem is, I want another in green and one in purple and maybe a blue one and a pink one….hehehe! So gorgeous! I have it on my to do list for this winter. Bought some red fabric too! Great shoes and I definitely prefer it with the collar…it´s such a cool design. Did you find the pattern had a lot of ease? e.g. you had to go several sized down? May I add that your hips are not too big at all? Overall I find your figure well-balanced. As we know, we could all avoid cake and all the rest. But even if you don´t I believe you are one of those lucky people who have a nice figure anyway. Hope my comment doesn´t sound offensive, didn´t mean to. Thanks! I just went with my measurements for this one, but I did have to take it in quite a lot at the front to get the fit right! Stunning! 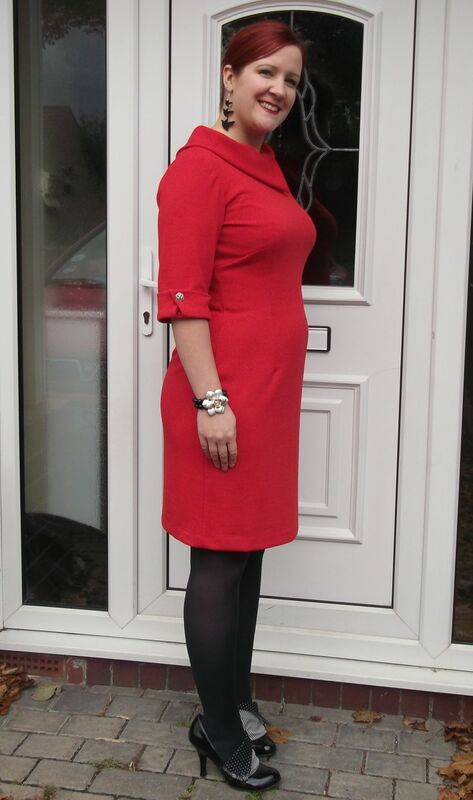 Thanks for posting up your changes for a double knit, omitting the zipper seems like a good idea and the fit is lovely! Thanks Stevie. I’m really pleased with it. Lovely dresses and I like the Irregular Choice shoes. You were right, you look so “prim and proper”, lady like. Hahaha, the very idea of me being ‘prim and proper’ tickles me! Do it! You won’t regret it! Ooh, definitely finish it! Would love to see! Just gorgeous! I have that pattern and definitely need a double knit version. 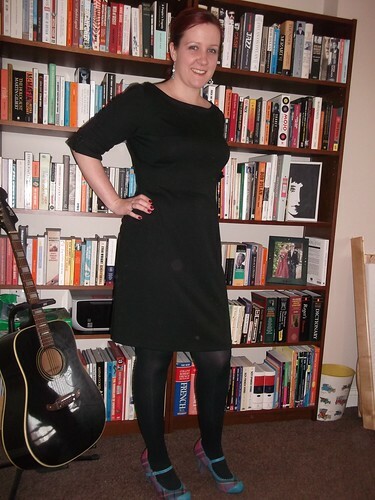 Very Joan Holloway- you look smashing! Now that is FAB! Definitely more grown up than the other 2 versions, altho I do like the grey one too. Can’t believe you’ve done THREE red Octobers!! Thank you! I’ll have to get thinking ahead now in preparation for Green December! You look great in red. I love this version. A real stunner. And those are some pretty cool shoes, too! The red is gorgeous! And I love that collar. Really pretty! Hahaha, I had better watch out! Thank you!